Government employees paid with tax dollars have a duty to serve the public, but when the wages of city employees are paid by private corporations, who do they really answer to? That’s the question raised by community members and a local ethicist after learning about an arrangement that allowed Google to pay more than $1 million to Sunnyvale city workers in the Transportation and Traffic Division of the city’s Public Works Department. The branch is responsible for making sure businesses like Apple, Yahoo, and Google reduce solo car trips to their offices, or face fines. But many wonder whether this funding agreement creates a conflict of interest for regulators. Anyone who’s driven through Sunnyvale during rush-hour knows that traffic can be a nightmare. Now emergency workers tell NBC Bay Area that the gridlock is creating a jam for first responders. “The traffic is such a problem at this point where it’s impacting the entire city,” said Sunnyvale Public Safety Officer Association President Frank Bellucci. “If a fire engine is responding to an emergency medical call and they aren’t able to get there in a timely fashion to meet some of those deadlines the survey is talking about, yes someone could die,” Bellucci told NBC Bay Area. Bellucci attributes the city’s traffic problems to the explosion of new development. He warned city leaders last year that Google’s proposal to expand in Moffet Park will increase traffic gridlock. Sunnyvale’s current plan to reduce traffic requires many businesses to reduce solo car trips taken by employees or face a potential fines as part of the Transportation Demand Management (TDM) Program. To meet these requirements, companies are encouraging commuter shuttles and carpooling. But some question the city’s ability to enforce the TDM program requirements when it comes to traffic caused by Google employees. In June 2016, Google agreed to pay $1.23 million through July 2019 for the city to hire a Traffic Engineer and Transportation Manager. Planning, Development, and Engineering Services Related to Google and City Transportation Projects Expenditure Report by Fiscal Year. Emails examined by NBC Bay Area show that one of these employees, the traffic engineer, helped review Google’s vehicle reduction plan for the company’s offices in Sunnyvale. Hana Callaghan, director of government ethics at the Markkula Center for Applied Ethics at Santa Clara University, told NBC Bay Area the agreement appears to create a conflict of interest. Callaghan said public agencies have the duty to avoid even the appearance of a conflict. No one from the city would speak on camera about controls to prevent a potential conflict. 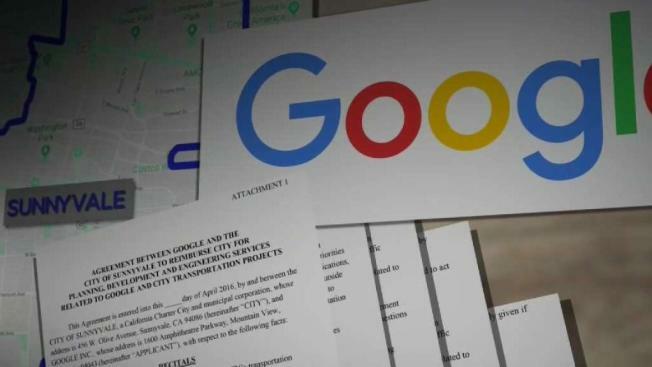 But a spokesperson for the city cited the contract, which stipulates that Google doesn’t have priority over the city’s employees funded by the agreement. The city also said in addition to the traffic manager, several managers review Google’s traffic reduction plans, which helps guard against preferential treatment. Meanwhile, Sunnyvale has been working with corporations to calm traffic. According to NBC Bay Area’s review of government records, the traffic engineer funded by Google found that the company failed to meet its trip reduction goals at Technology Corners, one of the company’s biggest Sunnyvale campuses, in 2017. Sunnyvale allowed Google to survey its own employees about their commute patterns again in 2018, and Google reports the location now exceeds the city’s traffic reduction goals. Google is the only company Sunnyvale has a funding agreement with. According to the city, the transportation manager was employed for a year and a half and the traffic engineer worked for the city for two years, leaving just before the new year. City records show the city was paid the full amount, even though the employees did not work the entire length of the three year contract. Mountain View has had a similar contract with Google to pay for staffers in the public works and community development departments. A spokesperson for the city said the employees were brought on to handle project demands from a variety of companies, in addition to Google. In nearby Cupertino, the city has a contract with Apple to reimburse the city for the cost of employees, if the city decides to hire extra workers. So far the city has not received any funds or hired those positions.